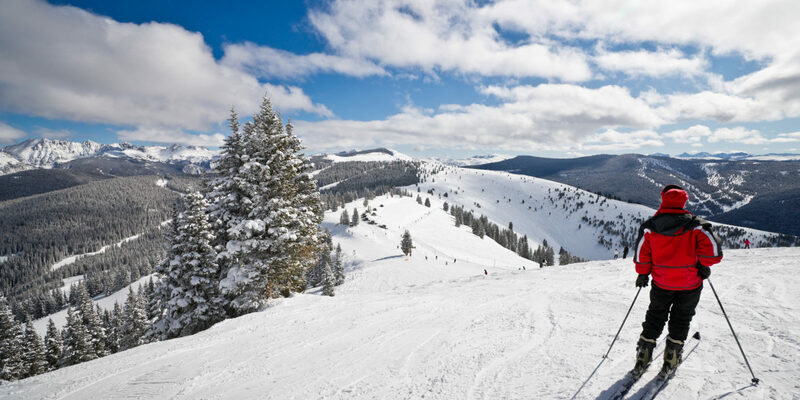 While there’s no such thing as a bad day on the slopes, I particularly love spring skiing in Colorado and California — thanks to temperatures that border on balmy and a mood that’s decidedly festive. Though much of the country experiences spring in the form of blooming flowers and those quintessential spring showers, the season looks a bit different for those of us who live in the mountains. 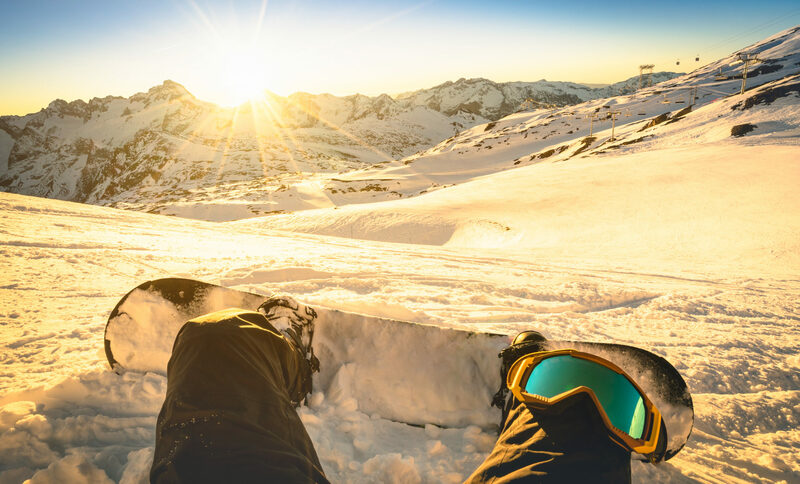 Yes, we too have warmer temperatures, but we still like to spend our time on the slopes, soaking up the sun on the snow. Spring skiing is a special phenomenon: a gift for those who choose to experience it. Whenever I ski in late March or early April, I find fresh snow alongside milder, bluebird skies and a unique vibe. No matter which mountain town I visit— from California’s Lake Tahoe to Colorado’s Rocky Mountains — people seem to embrace a more laid-back attitude. Mid-mountain barbecues are common, and the resorts host concerts and special events. If you’re planning a spring ski trip, you’re in for something special. Some of the biggest festivals at ski resorts happen in the spring. With catchy names like “Spring Fever,” “Spring Grüv,” and “Spring Back to Vail,” these events feature live music (often with big name headliners), parties and competitions. 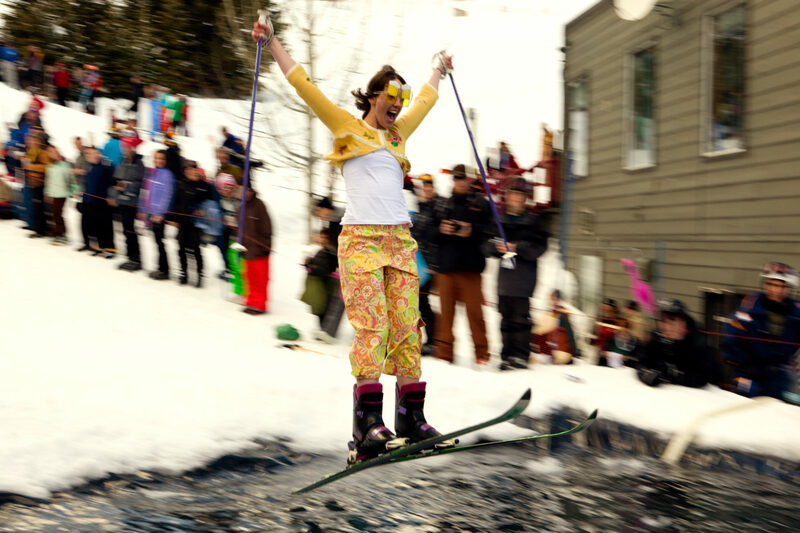 Pond skimming is one of the most popular spring activities, but it’s not for the faint of heart. This sport involves racing down the slope (in costume!) and attempting to “skim” across a specially built pond filled with water and make it to the other side. It’s much more fun (and safe!) to watch the event than to attempt it, according to a few fearless friends of mine who have tried it first-hand. I’m just fine cheering and laughing on the sidelines. There’s no way to predict how much snow may fall in the spring. Pick a destination that has spring-time entertainment and you’ll have a great time, even if the snowpack is less than ideal. I’m not sure where the tradition started, or when, for that matter. But closing day brings wacky costumes: the more over-the-top, the better. It’s entirely possible that you will share the chairlift with someone in a bikini or cruise past a Tyrannosaurus Rex (both of which have happened to me). Your costume doesn’t have to be elaborate, but every effort is appreciated. And you’ll have a lot more fun if you plan ahead and bring something quirky to wear. The sun shines longer in the spring, so make sure you’re prepared and wear plenty of sunscreen. The sun’s rays are fierce at altitude. While the on-snow and in-town entertainment can be epic, perhaps the best part of spring skiing is simply the weather. Warmer temperatures allow you to shed a few layers (I’ve even gone snowboarding in a T-shirt before). Spring also brings with it a phenomenon known as “corn snow,” created by alternating freezing and thawing temperatures. Slightly grainy and soft, corn snow makes skiing both fun and challenging, adding an extra flair to what is already a great day out on the slopes. So when you’re planning your ski vacation, don’t discount spring. It’s possibly one of the best kept secrets on snow.